Kraft Foods’ popular Lunchables brand is continuing its expansion with the unveiling of Lunchables’ Snackers. As part of the brand’s growing “Lunchables without a drink” line of products, Lunchables has introduced 2 varieties of ready-to-eat chicken nuggets (original and honey BBQ). In an increasing effort to keep its ingredients natural and its products healthy, these new products contain only white meat chicken, an excellent source of protein. The product was designed to serve as either a family-sized snack or an individual meal for hungry children of any age. The nuggets come in resealable bags allowing for them to be snacked on, or used all at once. 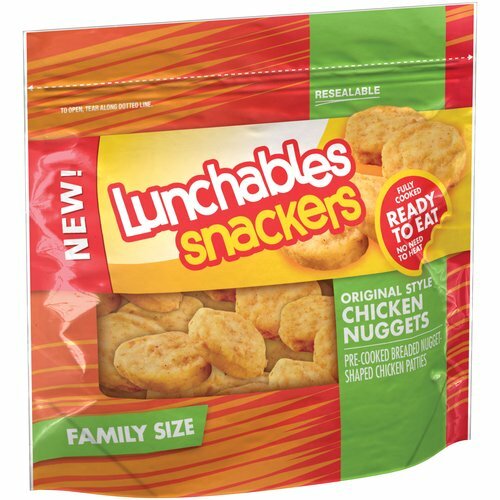 The 255g bags of ready-to-eat nuggets will be sold alongside other Lunchables products and will be rolled out nationally, with initial distribution through Walmart Stores. Lunchables was introduced in 1988 when Kraft foods sought to make a single-serve, multi-component lunch-time meal kit for children with no prep required. The brand has since released dozens of varieties of its product and continues to remain extremely popular among parents and children alike.